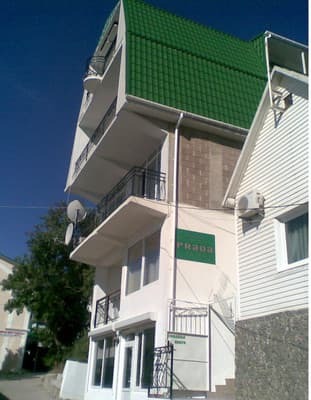 Mini-hotel "Prada" is located in the Professor's Corner, in the park area of ​​the recreation center "Otrada". Distance to the sea is 150 meters. Above the hotel is the forest. Quiet area, silence, closed territory under protection. Very clean sea. On the territory of the summer cafe. Hotel "Prada" contains 10 double large rooms (about 35 sq. M.) With 1 additional seat. 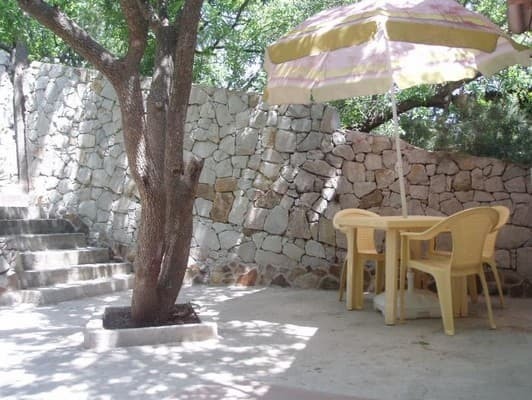 The rooms are equipped with air conditioning, TV, fridge, new furniture. The bathroom is combined. Hot and cold water constantly. 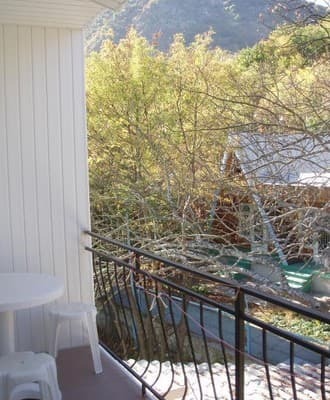 Open balconies open a chic view of the sea, mountains. PRICES MAY CHANGE, RECORD THE INFORMATION FROM THE OPERATOR! 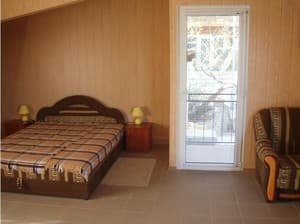 Description of the room: Number 4 - one-room double room with area of ​​40 sq.m. with the possibility of providing additional space. The frequency of cleaning in the room - daily. Hot and cold water round the clock. 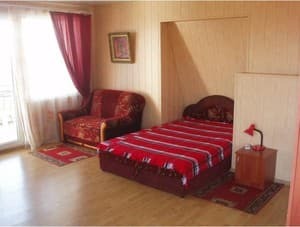 Description of the room: The room is about 40 square meters. m. Change of bed linen - 1 time in 5 days. Change of towels - 1 time in 2 days. Hot and cold water round the clock. 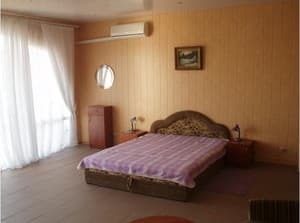 Description of the room: One-room double room 7 in the mini-hotel Prada is a cozy and comfortable room, with a balcony which offers a magnificent view of Alushta and the Black Sea. 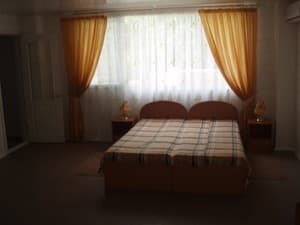 In the room for your holiday in Alushta there is a refrigerator, air conditioning, cable TV, safe, kettle, set of necessary utensils, access to wireless Internet, shower, toilet, washbasin. The frequency of cleaning in the room - daily. Change of bed linen - 1 time in 5 days. Change of cloths - 1 time in 2 days. Hot and cold water round the clock. The room is about 40 square meters. m. The room has the possibility of providing extra space. 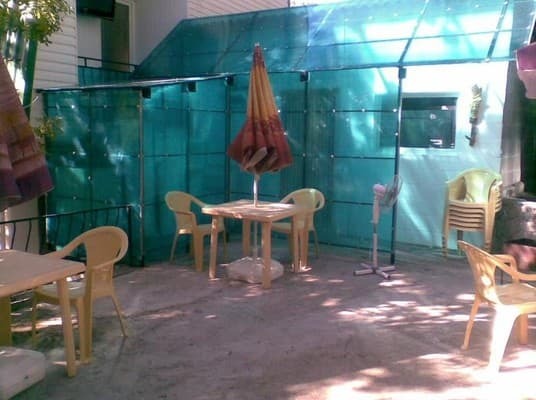 Description of the room: One-room double room 5 has the possibility of providing extra space. Hot and cold water round the clock. The room is about 40 square meters. 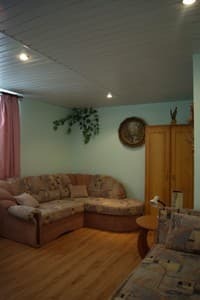 m.
Description of the room: Room area is 40 square meters. m is equipped with everything necessary for a comfortable stay. The room is equipped with a kitchen, which is equipped with everything necessary for self-cooking. The room has the possibility of providing extra space. 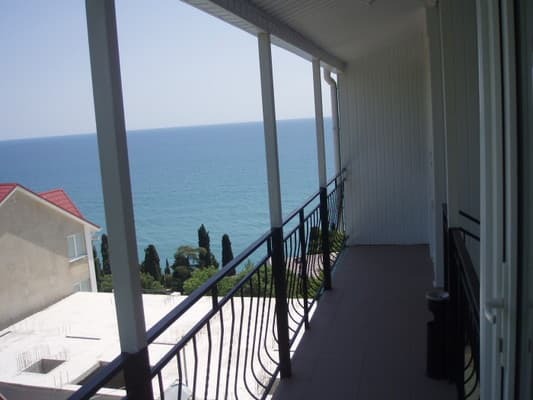 Description of the room: One room with a balcony overlooking the sea. 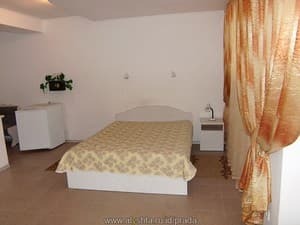 The room is very well furnished and equipped with everything necessary for rest. The frequency of cleaning in the room - daily. Change of bed linen - 1 time in 5 days. Change of towels - 1 time in 2 days. Hot and cold water round the clock. The room is about 40 square meters. m.
Description of the room: Room - one-room double room, in which there is the possibility of providing extra space. The frequency of cleaning in the room - daily. Change of bed linen - 1 time in 5 days. Change of towels - 1 time in 2 days. Hot and cold water round the clock. The room is about 40 square meters. m.
The cost of additional space to clarify. Distance to Simferopol - 50 km, Yalta - 35 km. Along with the "Simferopol-Alushta" buses, there are also "Simferopol-Alushta (Professor's Corner)", the final stop of which is Alushta, the Professor's Corner, Komsomolskaya Square (the final one); From the trolleybus ring in Alushta near the embankment there is a trolleybus ring, from there to the Professor Corner there is a trolleybus №2, and also minibuses. You can arrange a meeting at the station. Transfer is possible from anywhere in the Crimea.